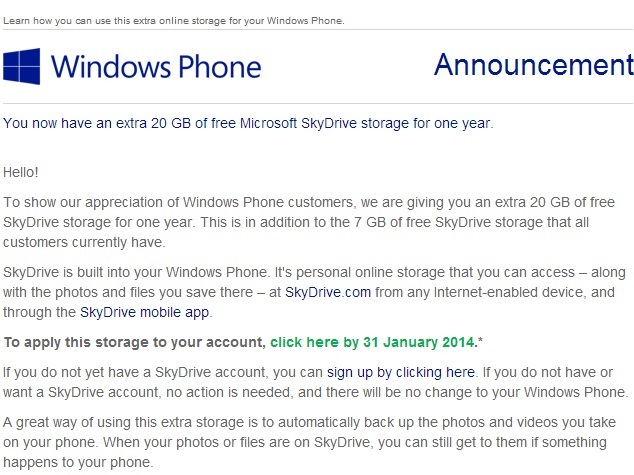 Microsoft is giving Windows Phone users additional 20GB of free SkyDrive storage for one year. It's worth pointing out that the 20GB of free storage being offered by Microsoft via SkyDrive is in addition to the 7GB already available. Microsoft confirmed the news by sending an email to the Live account linked to the Windows Phone device, which said, "You now have an extra 20GB of free Microsoft SkyDrive storage for one year." The mail also noted, "To show our appreciation of Windows Phone customers, we are giving you an extra 20GB of free SkyDrive storage for one year. This is in addition to the 7GB of free SkyDrive storage that all customers currently have." "A great way of using this extra storage is to automatically back up the photos and videos you take on your phone. When your photos or files are on SkyDrive, you can still get to them if something happens to your phone," further said the mail. The latest move by Microsoft could also be an attempt to attract more consumers to opt for its Windows Phone ecosystem this Christmas. Earlier, a survey claimed Windows-based smartphones were making significant inroads in Europe. The survey revealed Windows had a 12 percent share in Britain, 10.8 percent in France, 9.5 percent in Italy, 8.8 percent in Germany and 2.2 percent in Spain. In October, Google announced that it would be offering 25GB to 50GB free Drive space for select HTC smartphones launched in 2013. The HTC smartphones would be offered the additional cloud storage space for a limited period, which is two years.